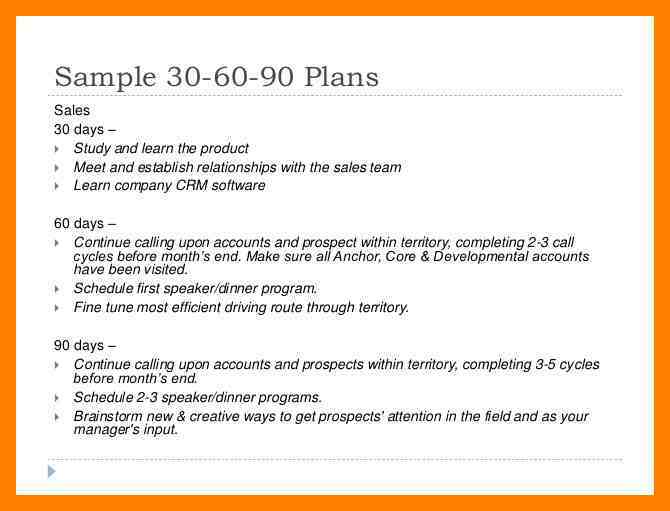 A 90-day plan is a personalized strategy that can outline your general plans for your first 3 months on the job. This is a particularly powerful tool that can help you understand and organize your responsibilities on your new job. Adjusting to another set of expectations following a job position is not as easy as it may sound. A 90-day plan will help you make this burden easier by creating a layout of all that you have to do. But, even if a 90-day plan can help you with your adjustments to your new job, its main purpose is not to help you. It’s actually created to guide the whole organization—you, your boss, and your teammates—toward a common perspective of what success means. It’s not about making sure that you keep a sure eye on the tasks that you are paid to do, it’s about career advancement for all of you in the team. You may also see weekly plan examples. It is a tool that must be designed for the progress of everyone’s careers. It is an unwritten promise that, at the end of 90 days, your career has taken a considerable leap from being a company rookie to an employee eligible for promotion. 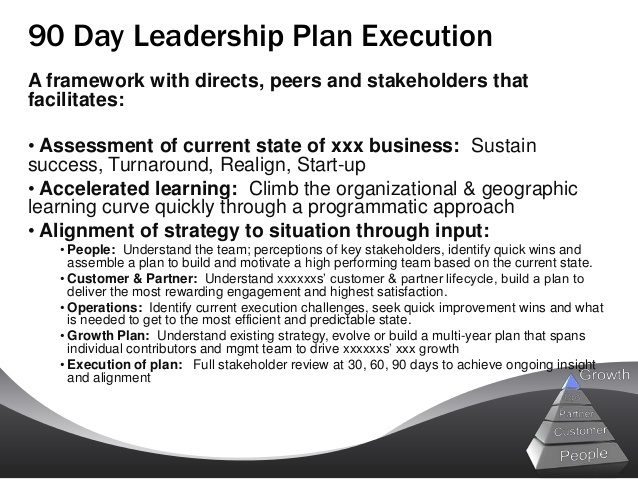 It should help you take to heart the organization’s purpose and strategy, the expectations they have of all their members, and position plans, decisions, and actions to serve the greater purpose of the company. You may also like daily plan examples. A 90-day plan is usually created during two occasions: during the final stages of an interview process and during your first early months in the job. The latter will be the focus of this article. What Does a 90-Day Plan Look Like? Although these things don’t follow a strict template and format, they do observe similar components. 1. 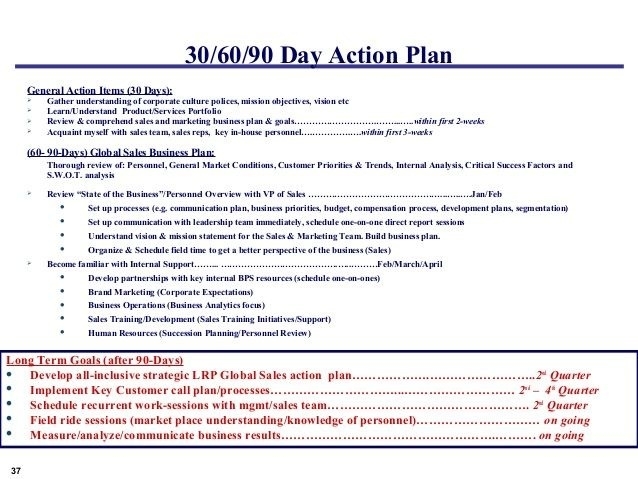 A 90-day plan contains a clear definition of objectives that are inspired by the values of the company. 2. It determines all specific outcomes and makes sure that they are created with respect to the company’s objectives. 3. It contains a specific set of tasks that need to be rigorously observed to achieve success. 4. It must have a timetable which will serve as a deadline. 5. It should have a scorecard, which will help you measure your success, and communicate it to others. 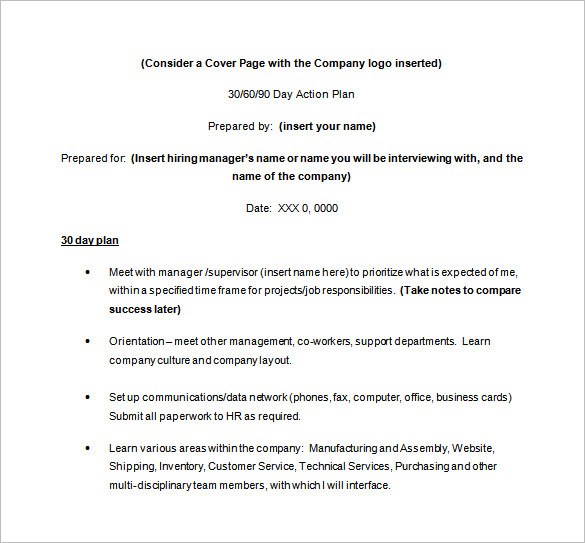 You may also see work plan examples. 1. Your first 30 days should be focused on learning. When you get a general view of the new set of problems and tasks that you will have to deal with, you might feel the need to solve things immediately which is good. It just shows that you are a natural leader since you are always looking for ways to fix things. You may also see risk plan examples. But, unfortunately for you, irregardless of your high position, you are still a newbie. This means that you still have so many things to learn. You probably even haven’t been introduced to your team’s goals. How do you expect yourself to effectively answer to problems you don’t know the causes of? The first 30 days of your stay as the new manager, understand your organization’s current state and the needs of your teammates so that you will plan how to approach your new position and your new constituents. It would also serve you best if you understand the important aspects of the company as a whole, such as financial issues, marketing strategies, and operational methods. You should also devote this amount of time (or more, if possible) to getting to know your members individually. What are their specific roles? What are their passions? What are their skills? What types of tasks will they genuinely enjoy? Delve into more personal attributes if you can, such as their ability, or inability, to work with groups. This is also when you should brief your members of your expectations of them, and for you to learn their expectations of you. You may also like transition plan examples. 2. Your second 30 days should be focused on clarifying. Since you are already familiar with what your team is supposed to achieve, and what your members are capable of achieving, you can now proceed to setting clear expectations, and analyzing and perfecting any existing plans. This is also the perfect time for you to make your team understand your expectations of how they should treat one another as you all work together. By this time, you should already have created a guideline for your team’s purpose, values, and professional goals, which you should communicate to your team as soon as possible. A good talk with your whole team is also much advised during this stage. All of you must be open about your individual goals and how you can meet that without compromising the success of your team’s goals. Speaking of which, you should set an accountability system to ensure that every team player contributes a part in your team’s overall success. You may also check out quality plan examples. 3. Your third 30 days should be focused on aligning. Since this is your third month as the manager, you should already have finalized every important aspect of your team’s duties to the entirety of the organization. For this stage, the job you are yet to do is to align them to the constitution that the whole company abides to. 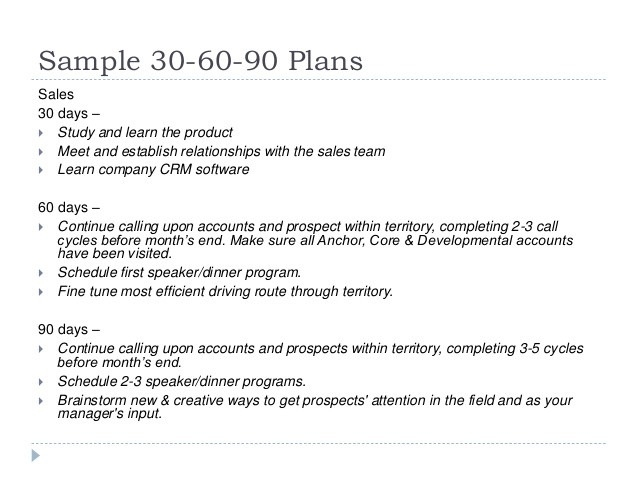 You might be interested in sales plan examples. By doing so, everyone will have a clear view of the playing field where they are tasked to work. It will make your members feel more purposeful which can encourage them to utilize their skills more willingly to push the whole team forward. It can also enable them to work as efficiently even when unsupervised because they know where and what to do anyway. You may also see project plan examples. Stepping into a new position and giving responsibility over a diverse bunch of individuals doesn’t really leave you much time to take care of your own adjustments because you will have to focus all of your energy into guiding your team. This is another burden that a 90-day plan will help ease. It will help you and your whole team see eye to eye on things that involve the whole organization. You may also check out personal plan examples. 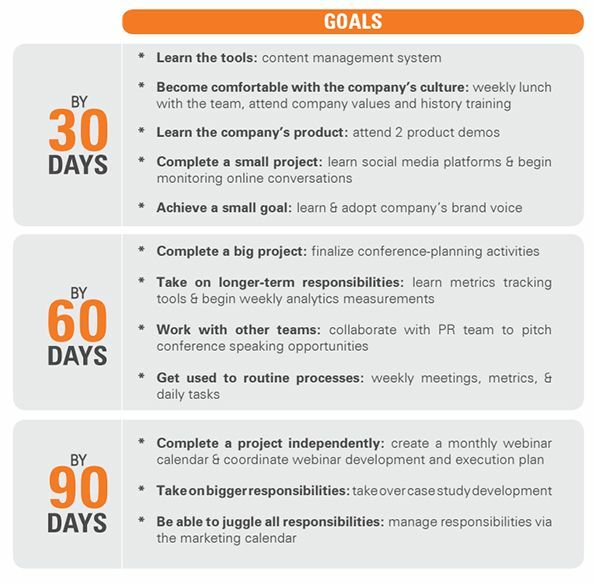 If you follow this 90-day plan, or use it to guide the one you are creating yourself, you can make sure that in under 3 months, you have not only adjusted to the new job. You have also gotten to know your team members, the organization you are working for, the goals you will spend your energy and resources to achieve, and the goals you will have to set yourself as the new manager. You might be interested in assessment plan examples.